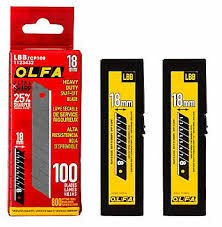 We are your source for Olfa replacement blades. Olfa Black blades are ultra sharp. We offer the complete line. Proudly Canadian serving customers across the country for the last 16 years. Olfa TSB-1 Top Sheet Cutter Blades, 5 blades/pk, 6 pk/box. Sold as box. For pricing please call us or email us at sales@nhsmedia.com. There is an Olfa blade for every job. If you need trimmers or guillotines, please visit our Art Products Section. Also take a look at all these paper craft ideas and quilting ideas.